How much would you pay for a new furry best friend? 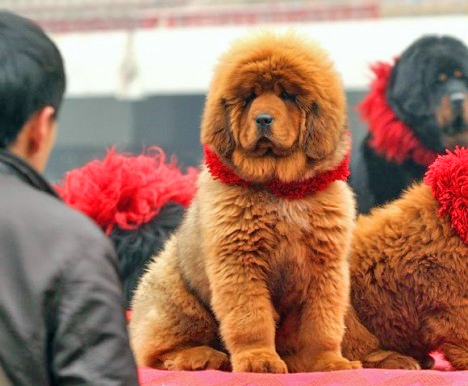 In China recently, an 11-month-old red Tibetan mastiff named Hong Dong (which translates to Big Splash), has been sold for more than $1.5 million, making it the world's most expensive dog. The Tibetan mastiff is an ancient breed that has long been renowned for its guardian skills, as it was bred to protect everything from herds and flocks to people, tents, buildings and villages. The breed is also famously known as the preferred companion animal for both Genghis Khan and Lord Buddha. In more recent times the breed has become a symbol of status among the Chinese high society, which has seen the price tag for owning one of these red majestic canines skyrocket to an unbelievable new level. While many would argue that it is absurd to spend that much on an animal, we want to know how much your furry best friend is worth to you. Let us know by participating in our opinion poll on the right of the page. These days dog enthusiasts are willing to pay for top quality bloodlines. I would not be surprised that the record amount paid for the dog will be broken in due time.